To anyone that saw me start following your blog and then shortly there after stop following your blog. Apparently when you import the blogs you are following into blogger from google reader, it quickly duplicates all those blogs back into your google reader in a folder/tag that can't be deleted or changed in anyway. Luckily you can stop following and they disappear from google reader. Until they fix this "feature" I'll stick to following you all on google reader. Sorry about that. 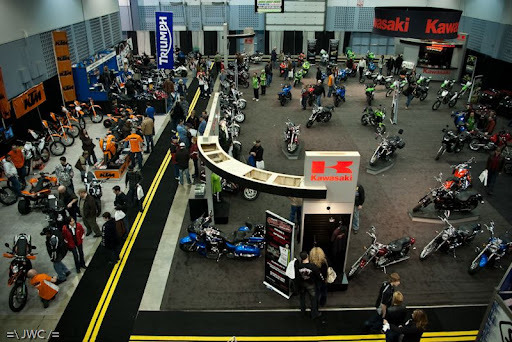 Me, my wife, my daughter and several members of my chapter of CMC went to the biggest motorcycle show in the Atlantic provinces. 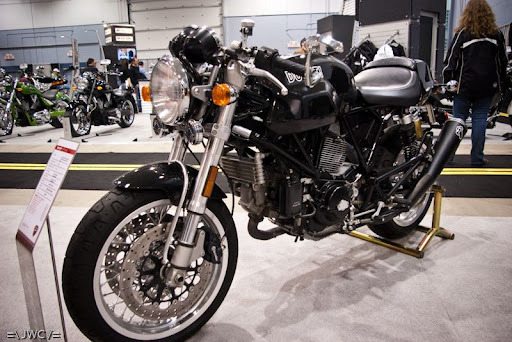 It was a full day of drooling over every two wheeled machine you could think of from practically every manufacturer out there. 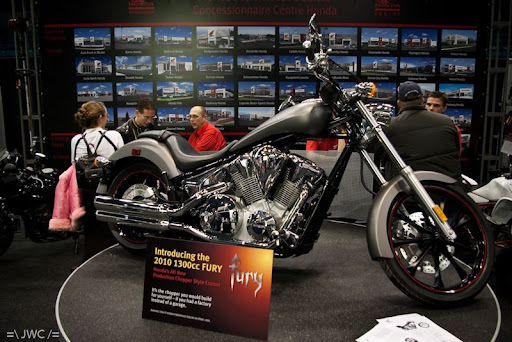 Even the new V-max and Fury were there. We also got to meet several members from the Halifax, NS chapter and renew acquaintances with members of the PEI chapters. Seeing so many of our patches around was fantastic. 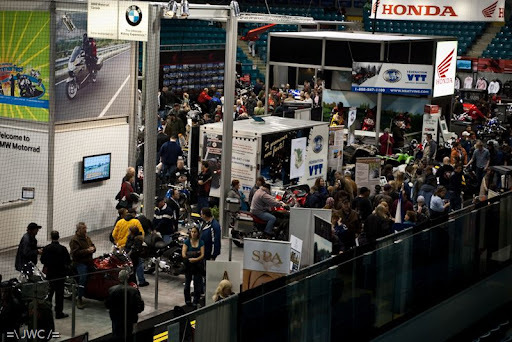 The show filled the Moncton Coliseum which included three ice rink sized floors and one upper level of booths for groups, charities and clubs. 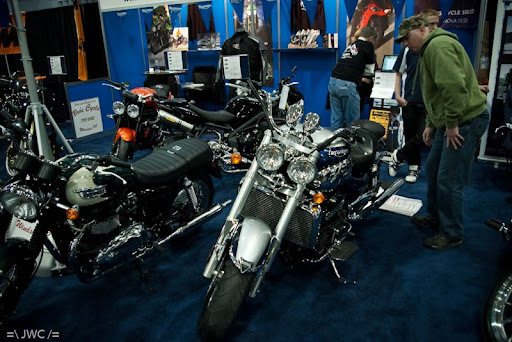 You started off with the booths which advertised local clubs, charities and events. The best showing there was the Bike Klub of Bernice MacNaughton High School. The group of kids in the Bike Klub built one fantastic looking bike and now they are looking for donations to help pay the way to a competition that I hope they win. Seriously, check it out. It's a beauty of a bike. After that, it was downstairs to where all the camper/trailer/mobile garages were setup. Very interesting way to have a place to sleep, eat and store your bike. Also on that level was the Yamaha Riding Academy. They had a small indoor course setup for giving basic training to kids up to 12 years old. Try as we might, our little one would not venture out. I'll get her into motorcycles yet! Once you were finished there you wandered out into the first of the main areas. 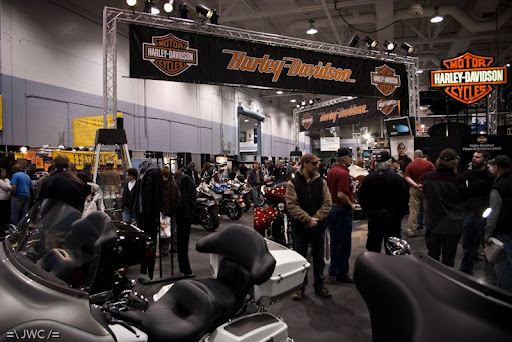 Here was Honda, OCC, and BMW, plus numerous advertising booths. 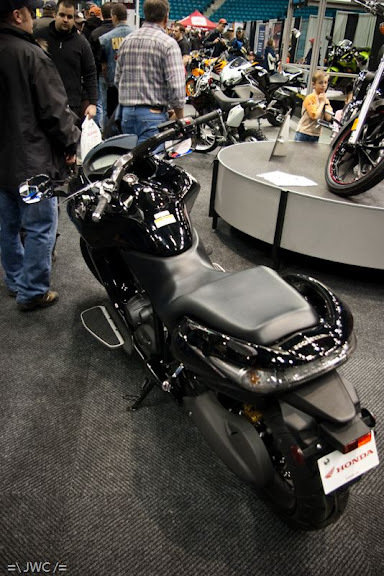 Honda also had the DN-01 on the floor, but I can't say I have much interest in the bike. It's a very interesting design, but it seems like more of a sexied up scooter. Moving on to the next section is where things exploded. 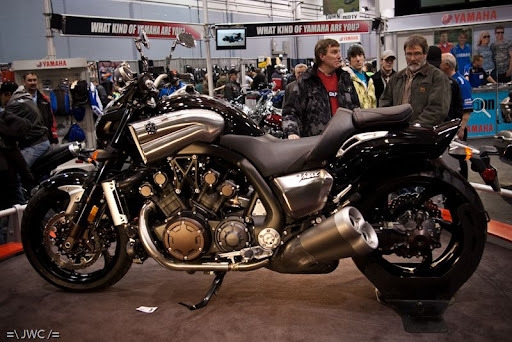 You are first presented with Yamaha and their newly re-created beast, the Vmax. Just sitting there it looked like it was ready to pounce on anyone that came near it. Thankfully it's rear tire was securely held. It's amazing to look at and I'm sure it would be one hell of an experience to ride. Harley Davidson owned the other half of this floor and I spent a fair amount of time drooling over the bike that I want. What really disappointed me was the fact that they didn't have the Iron 883 Sportster on hand. 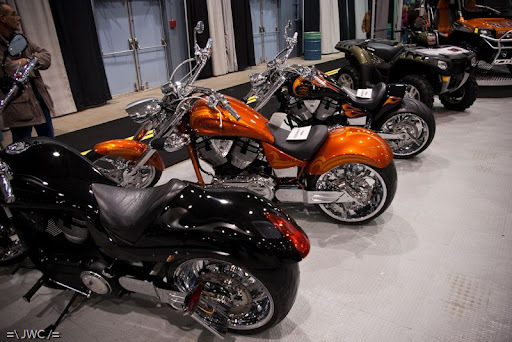 The funny part about that is a H-D dealership not 15 minutes away had one for sale. 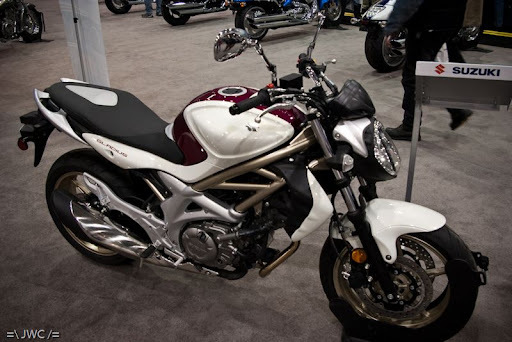 It was baffling to not see H-D's newest entry (and one of the most affordable). and KTM...sorry, no real pictures of KTM. Maybe not enough chrome for me? ;) Here's an overview shot. All in all, it was one hell of a day. 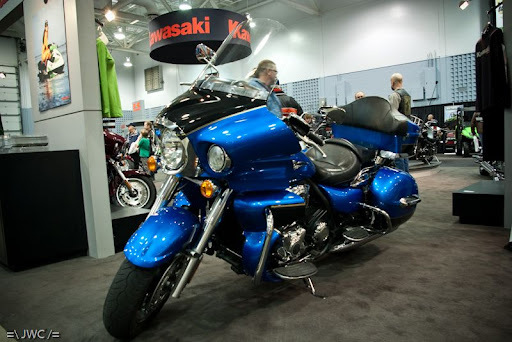 I got to hang out with my wife and my daughter at one of the largest motorcycle expos I've ever seen. I also got to meet several members from maritime CMC chapters which is always a treat. Nothing like total strangers treating you like family! We were beat, but had a great time! For once, I can actually say I'm happy to see rain. It's currently 3C (37F) out there with occasional rain showers. It's nice to wake up to a day without heavy blowing snow. I swear, this has been one of the worst winters we've had in years. Last night, we had a small gathering of our club members to celebrate the second anniversary of our chapter. 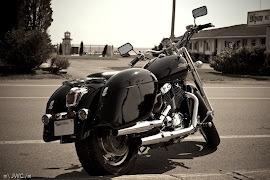 For two years we've been slowly growing and getting the word out about the Canadian Motorcycle Cruisers. It's difficult getting something like that growing in this city, but it's rewarding when you get everyone together. There are many things planned for the coming season including attendance at an east coast rally for our CMC chapters. It's crazy to think that March is right around the corner and I already have to start organizing and planning things. As much as I want winter to be over, I don't want time to go by too fast.